Why settle for a standard size, “plain vanilla" foyer mirror when Dulles Glass can help you customize the perfect one for your space? Entryways can be dark and narrow. A mirror is a great way to add light and the illusion of more space to your foyer. Don't be limited by the sizes of off-the-shelf mirrors! You can get the perfect size and cut, quickly and affordably, from Dulles Glass. 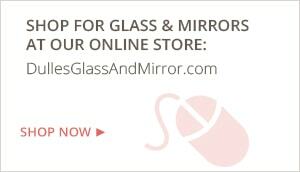 Why Choose a Dulles Glass Foyer Mirror? But don't worry...customizing your foyer mirror is easy with the experts at Dulles Glass. Just submit a quote with the information you do know about your mirror project, and someone will contact you with a preliminary quote for free, in 24 hours. We'll help you get it just right! Foyer mirrors from Dulles Glass are suitable no matter what type of space you have. Some homes have two-story entryways, or longer, narrower entries. No matter what your space, we can help you get the perfect look. Install a frameless fireplace mirror directly to the wall for the length of your entryway. This creates a sleek, modern look. Choose a selection of smaller mirrors in a variety of shapes or sizes – custom cut just how you want them – to create your own row of artwork in your entryway. Get the perfect-sized mirror cut just to fit your foyer, and don't settle for standard sizes that just don't look right. Then you can customize with your own choice of DIY frames for the perfect personal touch. We offer a comprehensive 2-year warranty on our installed mirror products. Dulles Glass foyer mirrors are made of 1/4" thick glass and all have a safety backing that helps prevent messy and dangerous accidents. Our mirror installation specialists can affix the mirror directly to the wall using a mirror mastic, or glue, for maximum safety. We'll cap this off with J-bars or L-bars, which are used to support the mirror at the top or bottom, along with your choice of decorative clips, standoffs, or rosettes if you prefer.